"Homer Tonight!" 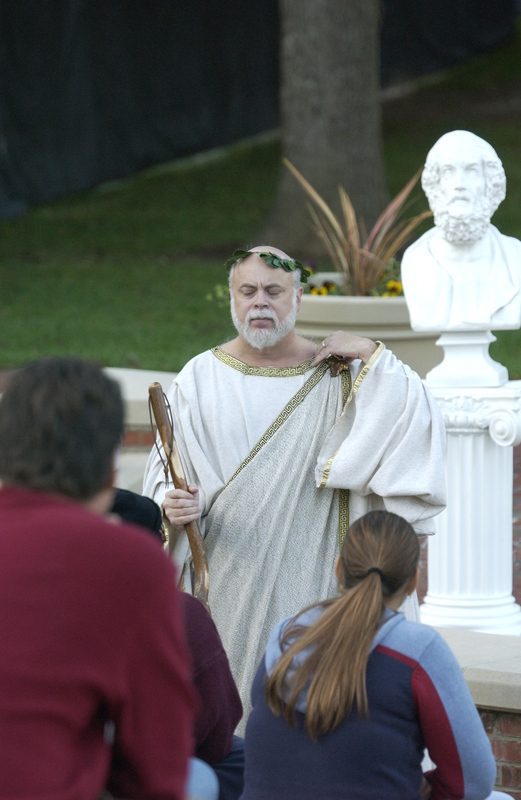 is a series of one-man shows in the manner of the ancient Greek rhapsodes. I recite/perform Books I, XXII, and XXIV of Homer's Iliad, with or without slides accompanying the show. This "act" is appropriate for Greek festivals, arts festivals, schools, and colleges--even coffee shops and bookstores, anywhere there are lovers of the classics. To learn more about the show, the "rhapsode," and Homer's Iliad, continue down the page. According to Greek myth, one day when the gods were gathered on Olympos, "Discord," who had not been invited, came long and threw among them a golden apple inscribed "To the fairest." The goddesses Hera, Athena, and Aphrodite argued about who should receive the prize, but since no god was stupid enough to allow himself to get drafted as a judge in this divine beauty contest, the goddesses turned to a mortal (poor wretch), Paris, a prince of Troy. Paris's qualifications for the job are irrelevant, since all three goddesses planned to bribe the judge anyway. Offering Paris the most beautiful human woman, Aphrodite succeeded in buying Paris's vote. However, that woman, Helen, already had a husband (worse luck). So the Trojans went to visit Helen and her husband, Menelaos, at their home in Sparta, and at the end of the visit, Paris took Helen back to Troy with him. Menelaos was not satisfied with this arrangement, so his brother, Agamemnon, rounded up warriors from all over Greece to go over to Troy to get Helen back, and to kill Trojans, and to get glory, and . . . to steal away everything they could get their hands on. The Iliad is not the story of the Trojan War, but rather the story of a brief period when Agamemnon, the leader of the Greek forces, and Achilles, the best Greek warrior, had a disatrous conflict over honor and the spoils of war. As the Iliad begins, the Trojan War has been going on for approximately nine years, and there is no end in sight. Nerves are perhaps a bit frayed. Some of the Greeks may even be doubting whether Zeus will ever "give into [their] hands the stong-walled citadel of Troy to be plundered." Athena--goddess of wisdom (but she's also a fighter), called "the grey-eyed goddess"
Briseis--Achilleus' war prize, his "bed companion"
Hephaistos--the lame blacksmith of the gods, "the renowned smith"
Hera--Zeus's wife, the queen of the gods, "Hera of the while arms," "the ox-eyed lady"
Thetis--Achilleus' mother, the "silver-footed," "the daughter of the sea's Ancient"
Shows run approximately one hour and, to suit client's needs, may be indoors or out. Indoor performances may be accompanied by slides, such as those that illustrate the "Selected Scenes" above. Price: Prices vary, depending on clients' wishes of single or multiple shows, with or without additional services, such as lectures or discussions with student groups, etc. Love Homer, The Iliad, Dr. Bob? Join the crowd: . . . and counting . . .